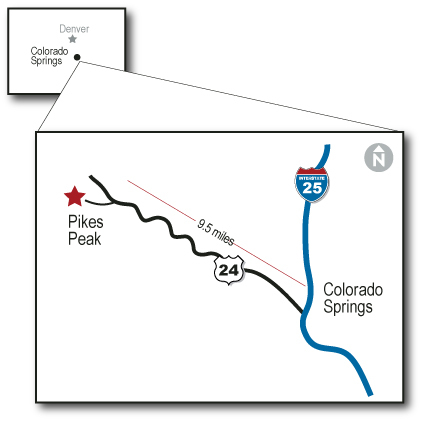 Pikes Peak is just a few short miles west of Colorado Springs, and only about an hour’s drive south of Denver. Eight major airlines carry passengers to and from Colorado Springs. Visit the Colorado Springs Airport Web site to learn more. Exit the airport on Pena Blvd. Take E-470 South (toll road) for about 34 miles. Then exit onto I-25 Southbound to Colorado Springs. In approximately 55 miles, take Exit #141 for US-24/West Cimarron St. Continue West on US 24 for about 9.5 miles. Exit the Airport on Milton Proby Parkway/Drennan Road. After approximately 4 miles, turn left on SE Academy Blvd/CO-83. In approximately 1.8 miles, merge onto I-25 North and continue for approximately 5.7 miles. Take Exit #141 for US-24/West Cimarron St. and continue West on US 24 for about 9.5 miles.